White people putting on blackface and dressing up as black people for entertainment and comedic purposes is disturbing and upsetting on many levels. To me, an aspect of this that is particularly horrific is the effect it had on the body, particularly the black body, that is so often deemed invisible, expendable, dangerous, or hypersexual. Minstrelsy contributed to these stereotypes and beliefs about the black body by controlling how others perceived it. Minstrelsy allowed white people to take ownership over the black body by literally putting it on as a costume through blackface. They were then able to “prove” an amount of stereotypes through this, especially on account that many of the audience members did not know whether the people on stage were actually black or not. Tying blackness to the body is something that has been done to justify colonialism as well as slavery. Much of this ties back to ideas that began to form during the Enlightenment. The Enlightenment marked the mind, reason, and individualism as core values; values that were used to distinguish between the “savage man” and “civilized man”. This was then used as reason to justify that the “savage” individual’s ideal role is physical labor, thus justifying slavery. The savage man was also believed to lack the intellect that the civilized man had. This idea was used justify the belief that people of differing races were of different species, and was also used to prove the need for savages to be “civilized” by Western/white society. These ideas reduced black people to merely a body, and deemed whites to be better because of their supposedly superior intellectual capabilities. It must be noted that this idea of connecting blackness to the body is deeply rooted in the belief that the body is sinful and dirty, as opposed to the purity of the mind. This is an idea which certainly can, and should, be questioned. But for the purpose of this blog post, it will be assumed that association with the body is going to be perceived by people as a negative thing. Minstrelsy further emphasized this association of blackness with the body. This is particularly evident in this advertisement for a Minstrel Show in 1899. This ad depicts black women as hyper-sexualized and alludes to the “Jezebel” stereotype, an idea rooted in slavery which labels black women as promiscuous and sexually aggressive. Referring to a black woman as a jezebel has often been used to blame the infidelity of white men on the black women they had relations with. This hyper-sexualization further associates black people to the body, and implies an inability to control bodily instincts. The men depicted in the advertisement also emphasizes the association of blackness with the body as opposed to the mind. This is done through their childlike reaction to the woman in the advertisement. Their facial expressions mimic childlike amusement with the female body, while simultaneously depicting black men as out of control of their sexual desires. By connecting blackness with sexualization and desire, it again implies that black people are not capable of putting mind over matter, thus emphasizing the dichotomy of whiteness as associated with the mind, and blackness with the body. Between the use of blackface, contributing to stereotypes, mockery, and misrepresentation of black culture, minstrel performances clearly have a a lot of racist elements within them. That being said, there are nuances to it. 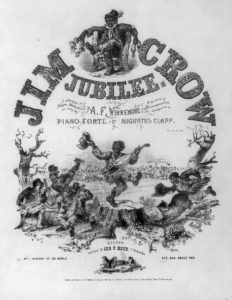 After all, it did allow black performers to have their first opportunity to perform in front of a white audience, and it could be argued that it helped popularize a variety of black music including spirituals. However even with these nuances, most aspects within minstrelsy perpetuated racism, sometimes in ways that are not as explicit as blackface, specifically strengthening the association of blackness with the body. Through this, minstrelsy reasserted this underlying justification behind treating black people as lesser that dates back to slavery and colonial times. 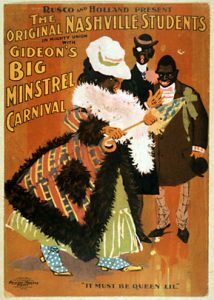 “Gideon’s Big Minstrel Carnival Advertisement.” In The American Mosaic: The African American Experience, ABC-CLIO, 2018. Image. https://africanamerican2.abc-clio.com/Search/Display/1612309. Marisa J. Fuentes, “Jezebel.” In The American Mosaic: The African American Experience, ABC-CLIO, 2018. https://africanamerican2.abc-clio.com/Search/Display/1750376. 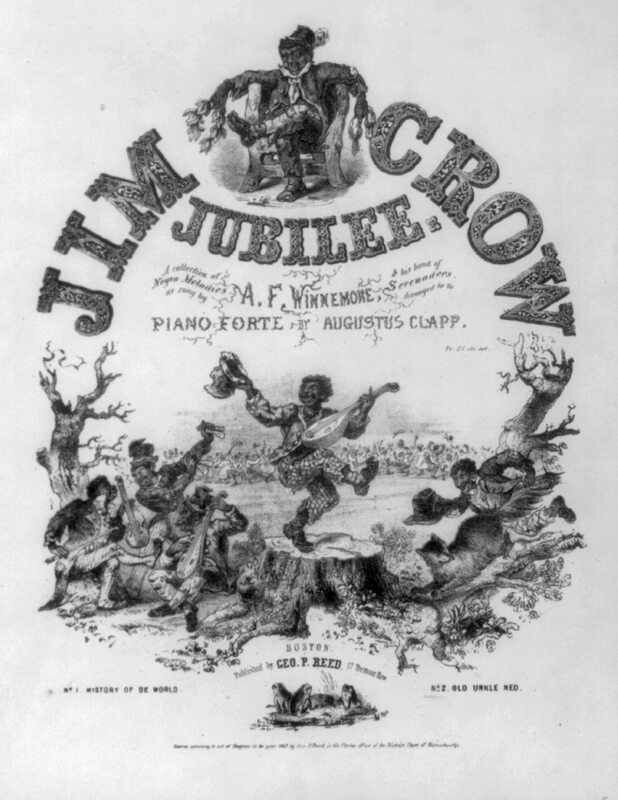 “Minstrel Music with African American Jim Crow Caricatures.” In The American Mosaic: The African American Experience, ABC-CLIO, 2018. https://africanamerican2.abc-clio.com/Search/Display/1612304. Peter A. Schrom, “The Enlightenment and the Origins of Racism” State University of New York at Albany, ProQuest Dissertations Publishing, 2016. This entry was posted in Teiana Nakano and tagged Black Body, blackface, Colonization, Enlightenment, Jezebel, Minstrel, Minstrelsy by Teiana Nakano. Bookmark the permalink.